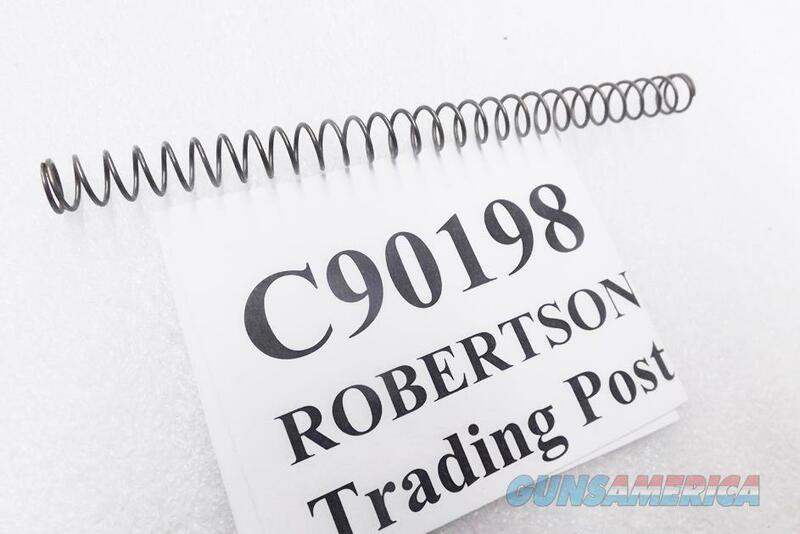 Description: This listing is for ONE Recoil or Return Spring. Buy 3, however, or any three parts, or non gun non ammo items, and shipping is FREE on the entire order, lower 48. From an Importer liquidation comes this unfired never installed factory Beretta Recoil Spring for 92 Series Pistols with 5 inch barrels, chambered in 9mm caliber. Manufacturer was Fabbrica d’Armi Pietro Beretta S.p.A. of Gardone, Italy. These parts were produced in 2011. Factory number is C90198. Schematic View Number is #18, see the schematic pic. Construction is spring steel. Finish is heat treated blue. These springs are drop in, no fitting required. They will fit any Government Size 5 inch barreled Beretta 92 series pistol, including models 92, 92S, 92SB, 92SBF, 92F, 92FS, 92D, 92A1, Brigadier, Elite models. and M Nine pistols chambered in 9mm that have a slide length of 7 9/16 inches from slide face to rear. They will Not work in a Taurus, will Not work in a Chiappa copy, will Not work on the door handle of a 1937 Dodge Blue Bird School Bus. Surface detractions are negligible, only faint inconspicuous streaks from storage for five years. Replacement pricing on many Beretta parts runs upwards of $50 apiece or even more. We’re offering the Beretta recoil or return springs in the photos, however, or their identical mates from the same production lot, each	for only $ 5.00. Gun parts shipments to Puerto Rico must ship to an FFL. Add any number of 15 or 17 round ACT-Mag Italian Magazines only $19 each, no extra shipping. No Hi-caps to civilians restrictive jurisdictions. >>>>>>>>>>>>>>>>>>>>>>>>>>>>>>>>>>>>>>>>>> $3 Lower 48 First Class Mail Padded Envelope; $10 Priority to AK HI PR. First Class sometimes requires removing the item from its package..